Offering panels in permanent monolithic, segmented, glass and stack configurations, virtually any aesthetic can be achieved. Its universal hinge connection system makes it one of the simplest and fastest systems to install. Divi can take your office to new heights for less. From open plan to private workspaces, Divi can bring your vision to life. Available in permanent monolithic, segmented, glass and stack configurations. Panels are 2” thick, with tackable core option. 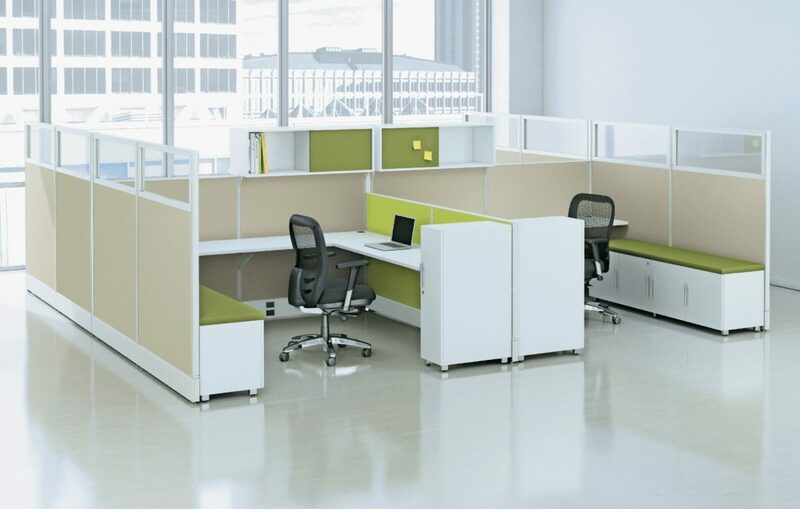 Panel frames are constructed of an OSB wood frame with fiberboard skin and honeycomb interior. 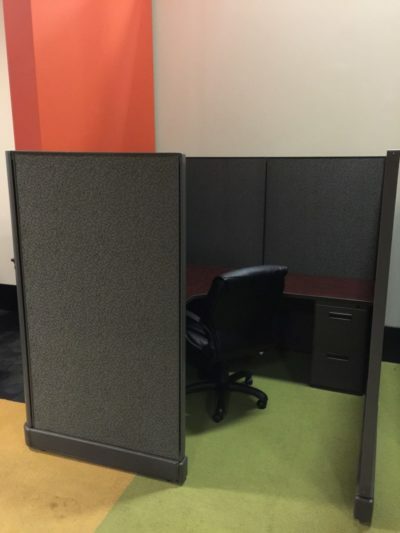 Frames available in 42”, 50”, 66”, and 82” heights. 16” High Glass or Solid Stack Kit available. Cannot be double stacked, and are non-load bearing. Tiles are pressure fit between left and right vertical channels, and are progressive, factory installed, pre-configured, starting from the bottom up. No tools or hardware are required for installation or removal. 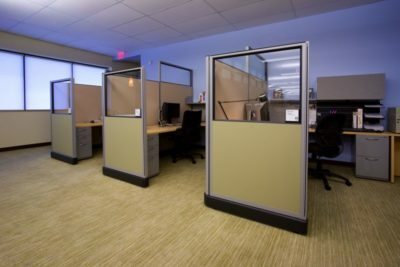 Tile options include: fabric, glass, laminate and whiteboard. ADA door panel options available. Base power raceway with lateral routing at the base only, and no vertical routing capabilities. 8 wire, 4 circuit electrical system standard, with 2×2 capability. Electrical includes the option to pass from a powered panel thru a non powered panel into a powered panel with a pass-through jumper extender. Power ways can be removed in the field without having to disassemble the panel. Dedicated 3×2 in. cross-section at the base of the panel only for data cables. Pedestals constructed of 20 gauge steel, available in depths of 24” and 30” deep, and pass ANSI/BIFMA testing for load weight capacity. DiVi is on GSA Schedule, and meets all the ANSI/BIFMA, fire testing, and other criteria contained therein to be on GSA schedule. Product comes with Lifetime Warranty for manufacturer’s defects. 10 day QuickShip option, with a minimum of 125 standard fabrics, 30 standard laminates, and 9 paint options on quick ship program. 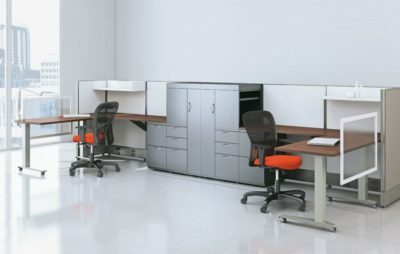 Quick ship available for orders up to 200 workstations. Maximum lead time may not exceed 4 weeks, or 20 working days for any cataloged Divi product line.